Using patented Generation 5 technology, Sage has designed a series of ultra-responsive fly rods with a livelier blank and a narrower, lighter shaft. The “ACCEL” series will be available in single-hand, switch and two-hand fly rods, beginning in August 2014. Bainbridge Island, Wash. (June 12, 2014)–Renowned fly rod manufacturer, Sage, brings medium-fast action single-hand, switch and two-hand fly rods to the market with the ACCEL series by reinventing proven Generation 5 technology. The ACCEL comes in an emerald green blank color with olive green thread wraps with garnet and black trim wraps. Fuji ceramic stripper guides and hard-chromed snake guides and tip top complete the blank. Freshwater rods from 3-6 weights have a rosewood insert with stealth black anodized aluminum up-locking reel seat and a snub-nose, half-wells cork handle. Saltwater models from 6-9 weights feature a stealth black anodized aluminum up-locking reel seat and also feature a snub-nose, half-wells cork handle. The switch and two-hand models have a cork grip on both the fore and rear grips. The ACCEL will come in a black rod bag with emerald green logo and model tag inside a leaf green ballistic nylon rod tube with a divided liner. All models come in 4-piece configurations and will be available in August. 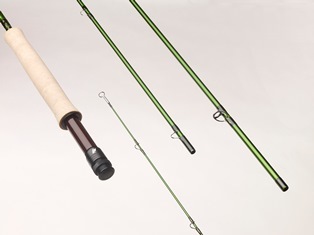 Single-hand rods will retail fro $595, switch rods will retail for $695, and the two-handed models will retail for $750.